NEW YORK — As fans stood to celebrate the new US Open champion, Sloane Stephens turned and stared at her player’s box, thinking about the journey this year that took her from wearing a cast on her broken left foot to hoisting her first Grand Slam trophy. On a night where two African-American women not named Williams met in a Grand Slam final for the first time, Stephens put on a clinic in easily handling Madison Keys, 6-3, 6-0, in a match that took just 61 minutes. Stephens becomes just the fourth African-American woman to win a Grand Slam singles title, following Althea Gibson, Serena Williams and Venus Williams. It capped an incredible journey in which Stephens started the year with the broken foot and fell so far down the WTA rankings that she entered the US Open concerned about whether she’d have exemptions into future tournaments. Stephens’ win, the 15th in her past 17 matches, shows just how wide-open women’s tennis is today as she becomes the fourth different woman to win a Grand Slam title this year. Serena Williams missed most of the year after winning the Australian Open while she was eight weeks pregnant. Cashes the biggest check of her career, with the winner taking home $3.7 million (Keys won $1.825 million as the runner-up). Stephens’ best earnings year prior to Saturday was 2013, when she earned $1.4 million after advancing to the Australian Open semifinals. Won the title as the No. 83-ranked player in the world, becoming the lowest-ranked player to win a US Open championship (Kim Clijsters was unranked when she won the 2009 title). Stephens is just the third US Open winner from outside the top 10. Reaches the top 20 in WTA rankings with the victory, at No. 17. That’s a 917-spot improvement in just over a month for Stephens, who was ranked No. 934 at the start of August. Had the same number of wins in this year’s US Open (six) than she had in her previous appearances at the tournament combined. Stephens and Keys shared a long embrace at the end of the match. As the two waited for the trophy presentation, Stephens pulled up a chair next to Keys and the two had a brief conversation. 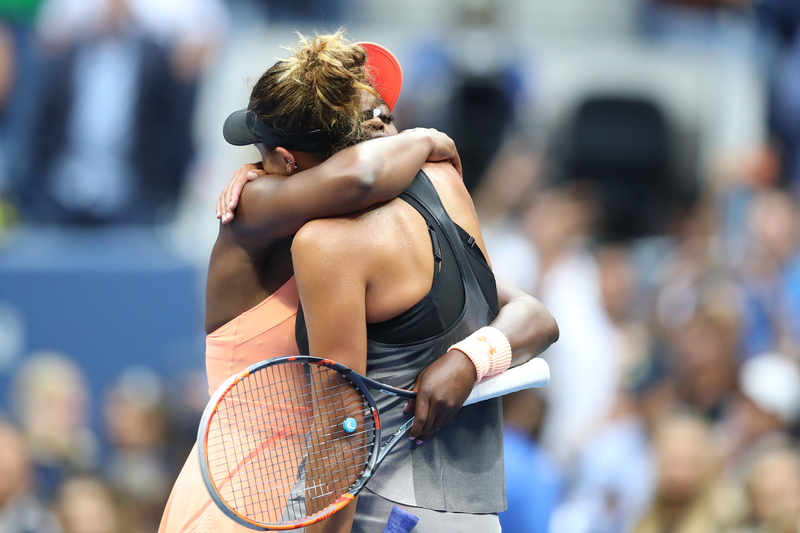 Winner Sloane Stephens of the United States (left) hugs Madison Keys of the United States at the net after the women’s singles final of the US Open at the USTA Billie Jean King National Tennis Center on Sept. 9 in Flushing, Queens, New York City. Stephens was clearly the more dominant player against her good friend Keys, who admitted she never felt settled the entire match. Stephens said she was nervous as well, spending a restless Friday night leading into the Saturday afternoon final. There were no nerves once she took the court. Stephens demonstrated power and quickness as she crushed Keys’ spirit. In her final match of an impressive two weeks, Stephens committed just six unforced errors. As she took the media podium with the US Open trophy bearing her name in front of her, Stephens was asked whether the win would give her a greater hunger for another Grand Slam title. Regardless of what happens the rest of her career, Stephens said winning the US Open on Saturday night is life-altering.